I haven't blogged that much recently but that didn't mean I wasn't sewing. 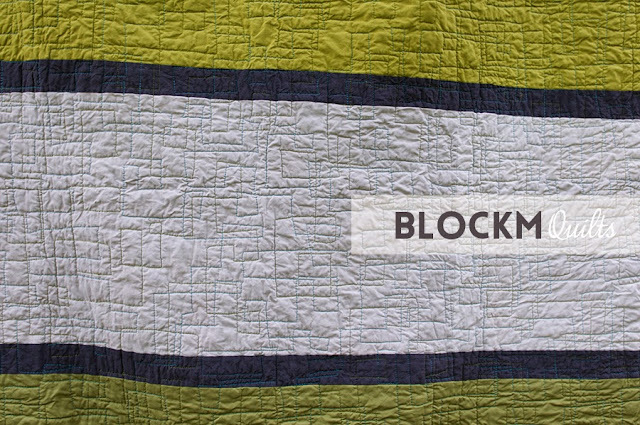 I was actually working on a new quilt which I proudly present for the Bloggers' Quilt Festival! This is also my first custom made quilt for the wife of a dear colleague. She wanted a quilt with turqouise and green and rather dark colours as it might be that their dog is snuggeling up in the quilt as well, so no white. I met the two around Christmas and brought a selection of my fabrics in the desired colours and also colours which accompany the combination. I also brought all my quilts (..aham, four in total in fairness) to show her what a quilt is actually made of and how it feels. She picked beautiful fabrics and I was really happy that she liked my Gogglebox quilt so much that she wanted the same design for herself. So I combined greens and turquoise with some splashes of red and grey and opted for this beautiful anthracite Oakshott fabrics for the grid and binding. 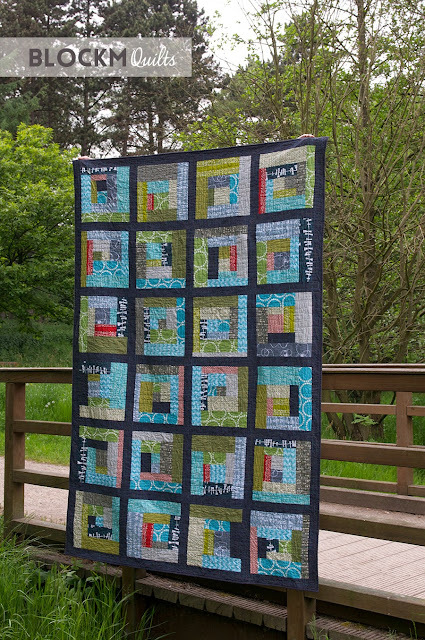 For the back I opted for a similar design to Gogglebox repeating three blocks and the grid with solid fabrics. Due to heavy work load and only weekend sewing sessions it took me until now (end of May) to finish the quilt. I also only issue it at the very last minute for the Bloggers' Quilt Festival. 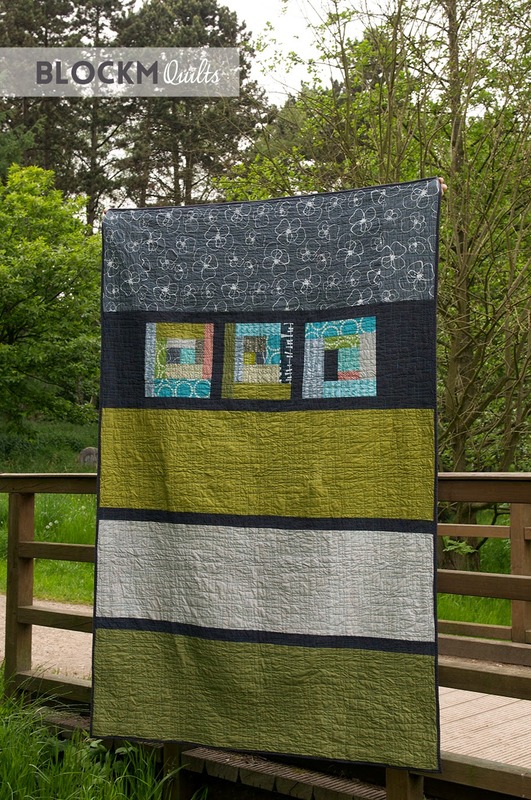 I free motion quilted in two different thread colours, again green and turquoise, and it really stands out on the anthracite fabrics and the light grey at the back. 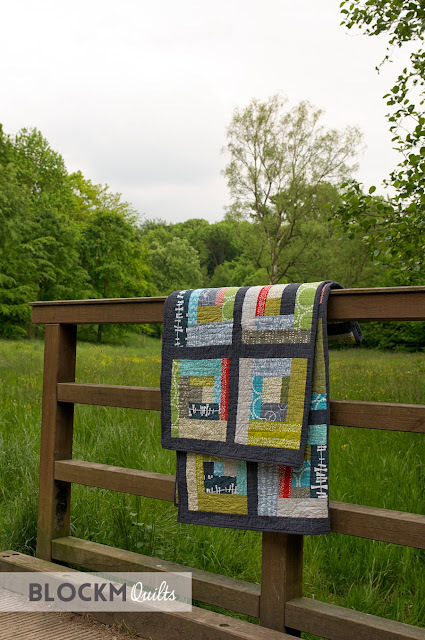 I'm very happy with this quilt which I named 'Head over heels' due to the elegant Oakshott grid and splashes or red. I'm already having a hard time letting it go, it needs to go in the wash one more time and then it can go to it's new owners. 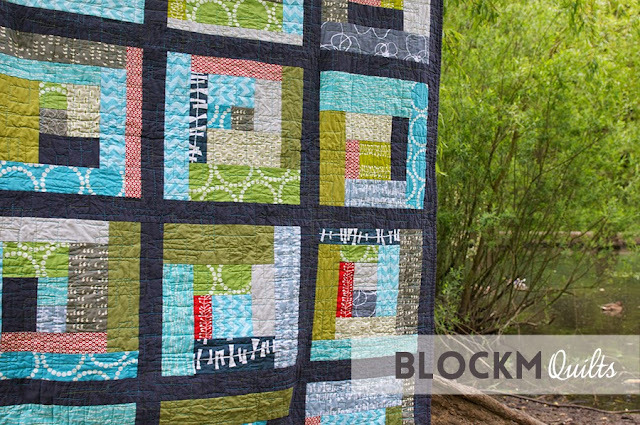 I'm happy to participate the second time in the Bloggers' Quilt Festival, this is such a great online quilt show! So this is your 5th quilt! It is gorgeous! 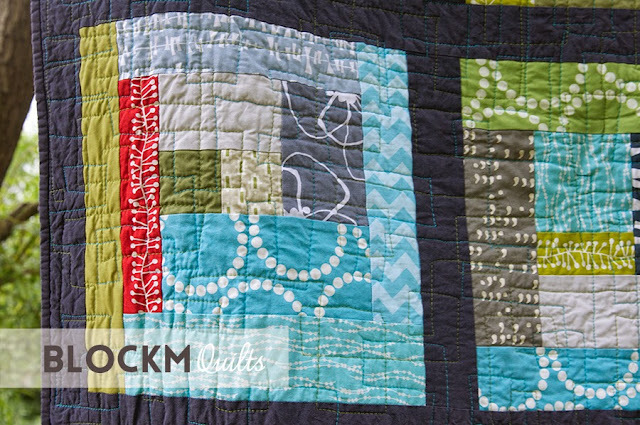 I love your fabrics and the quilting too! Thanks, Sarah! This is actually my 9th quilt, but I only happen own 5 of them and the last of these was not finished at the time I met the couple so I could only show them 4... sorry for the confusion. Goodluck to you, looks like a great entry! Thanks so much, it's always exciting to enter a competition! 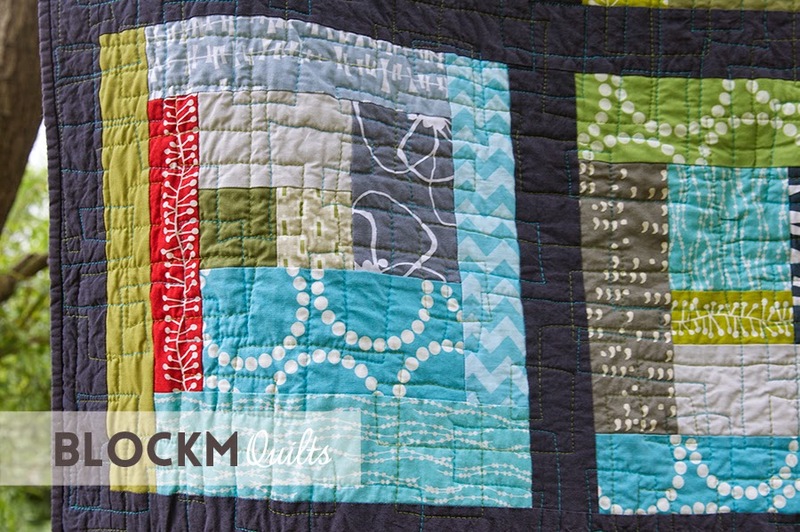 Love the colors in this quilt. 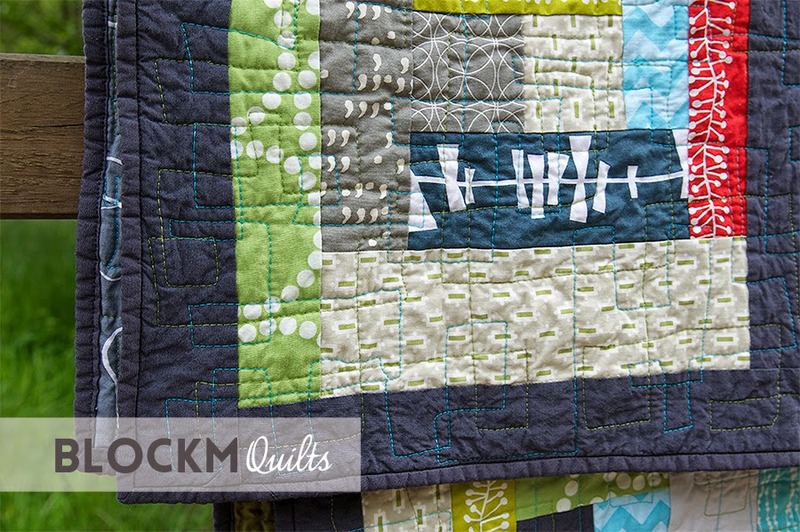 I always LOVE log cabin quilts. Me too! There are so many varieties in log cabin quilts, if you compare my Googlebox quilt with this one, even though it's the exact same principle they do look completely different! The quilt looks great! Love the colors and the bi-color-quilting. Thank you, Melanie! The quilting was a lot of fun! You did a wonderful job! I haven't tried an improv quilt yet, but you inspire me. Oh, thank you!! A log cabin block is actually a good way to play with different colours and different width of the strips. And a great way to start some improvising, you can just cut the blocks to the desired size!